Nell Stillman, a minor character in other novels by Sullivan, gets to shine here. This is Nell’s life story, from early married life to old age, all set in the small town of Harvester, Minnesota. After her husband dies suddenly, leaving her with young son Hillyard, Nell is relieved to be offered a job as third-grade teacher. However, teachers in the late 19th century and early 20th century were held to very high standards. Small town gossip can be harsh, and often anonymous. Nell brings a young cousin, Elvira, to live with Nell and Hilly in their apartment over Rabel’s Meat Market. A few years later, she leaves town in disgrace, and Nell is blamed. Nell’s main comfort in life, besides her loyal friends, is reading and re-reading the light, humorous novels of P.G. Wodehouse. My only complaint about this absorbing, character driven novel is that a book about the value of light humorous fiction shouldn’t be quite so serious and often melancholy in tone. I enjoyed reading about the changes in Harvester and in Nell’s apartment over the years including the building of a library, but two world wars and the depression do not make for light reading, especially as Hilly comes home from war shell-shocked. 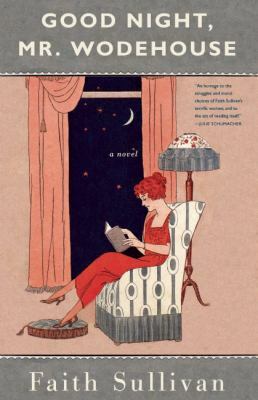 Nell does find love later in life, but a book that covers many decades inevitably includes several deaths. To cheer up I might read one of P.G. Wodehouse’s books (our library owns thirty, and they are quite funny, if now somewhat dated), but I plan to read more of Sullivan’s work, starting with The Cape Ann.